Enjoy the warm hospitality of your host Roberta who is passionate about ensuring your stay is as comfortable and memorable as possible. Your host is a semi-retired professor and health scientist at the University of Toronto, and has experience running B&B’s since 1990. I have renovated three homes (and survived!) but was especially thrilled when this particular historic home came on the market in 2010 and embarked on a major renovation and restoration journey. We have taken care to respect the history of the home and to carefully balance the addition of modern amenities while retaining and enhancing the original character of this turn-of-the-century Victorian home. Edwardian and Victorian architectural features such as stained and leaded glass, detailed fretwork, oak paneling, cherry inlaid floors, two staircases, and unique arched doorways are just some of the many details to admire. We have added beautiful antique chandeliers and restored the plaster crown moldings, archways and medallions to their original glory. We have a lovely collection of contemporary, modern and botanical art displayed throughout the home–a taste influenced by my parents who also enjoyed and collected art. Some of their pieces hang on the walls of Annex Garden today. They loved to entertain and have inspired me to carry on the family tradition. I also gained valuable experience waitressing in Yorkville in my student years. We are always ready to help guests with questions about the neighbourhood and to share our local knowledge on everything from what’s happening in the city, how to get around, and top picks for dining. What would you like to know? Just ask us! You can also count on canine hostesses Flossie and Maggie (Orange Blossom Special and Magnolia Blossom in another life), mother and daughter retired show dogs. Whether you know them as les carlins, carlini, mops, doguillo or just plain pugs, you will find these little ladies a treat. 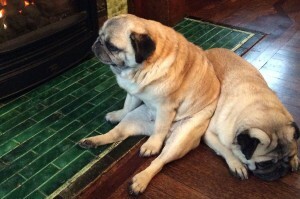 These adorable pugs will greet you upon your arrival and comings and goings. When you join us in the main dining room for a delectable breakfast in the morning, don’t be surprised if you feel something warm and soft come to rest on your feet. This would be Maggie, our foot warmer!